Paperback; 105 pages. 2008. Valuable problem-solving and leadership development for health care executives, mid-level administrators, department heads, clinical leaders, and anyone who brings a passion to their work. 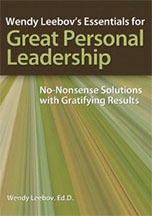 Each chapter captures the essence of emotionally intelligent leadership and focuses on effective solutions.